Christmas is a heartwarming time of year for a lot of people and especially for children. It’s traditionally celebrated with special foods, treasured rituals, and lots of presents. Imagine, though, being excited about Christmas as an orphan in Africa and your presents are a home baked gingerbread man, a handful of nuts and candy, and a dress picked out from a box of donated clothes from Germany. 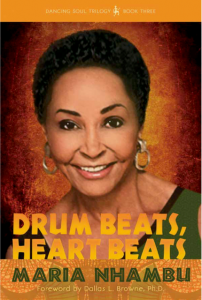 That’s the Christmas that Maria Nhambu describes in her memoir Africa’s Child. Only a few days old, she was left at an orphanage in Tanzania for mixed race children run by German nuns. The Don Bosco Home in Kifungilo was also a boarding school for biracial children who went home to spend the holidays with their families. Nhambu describes in detail, from a child’s point of view, the wonder of Christmas preparations—the sacrifices and good deeds the children practiced during Advent, the fun of going through boxes of donated clothes to find a pretty dress, the secretiveness of the nuns as they prepared the festivities, the trip to the nearby pine forest to cut down and bring back a tree, and the sharing of wishes for Christmas gifts with other orphans. Her constant wish, besides food, was to find her mother. She had no idea who she was, where she came from, if she had a family or tribe, or why she was alone. The excitement around Christmas filled her with hope and anticipation. Finally, it was Christmas eve. The children assembled in excited anticipation in front of the doors to the recreation hall. When the doors opened, the children saw the room transformed: the tree was lit with candles, sparkly decorations streamed from the ceiling, and a nearly life-sized Baby Jesus smiled from the nativity scene in a corner of the hall. The tables pushed to the walls held the individual collections of gifts waiting for the children. Before receiving their gifts, they performed the nativity play they had rehearsed and a special song about decorating the Christmas tree where each child became an ornament. All this was to the delight of the audience of nuns who requested encores and laughed and applauded the children. At gift time the children found their names and presents set on the long tables: gingerbread men, peanuts, candy, socks and underwear, some marbles, and maybe cloth dolls sewn by the retired nuns. Nhambu would always immediately pull her new dress over the one she had on and trudge over to the nun in charge of her upbringing to thank her for the gifts she received. After exploring their gifts, the children then went to bed only to get up in a few hours for the solemn beauty of the music and hymns of midnight Mass. Then it was back to bed with their gifts tucked under the blankets with them. Christmas day would bring a special meal and a day off from chores. For her last Christmas at the orphanage, Nhambu invited two American teachers from the high school she attended run by Maryknoll nuns. The two women, on witnessing the Christmas scene in front of them, burst into tears and ran back to the guest room leaving a bewildered Nhambu wondering what had happened. When Nhambu questioned them later about their reaction, they said they had felt sad. Nhambu couldn’t understand how the children’s joy and delight and the festive atmosphere that pervaded the orphanage had made them sad. 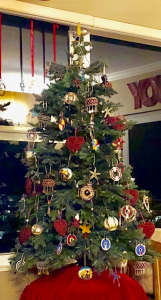 To this day, Nhambu remembers and relives the beauty and joy of her orphanage Christmases and decorates her house with treasured ornaments from around the world. 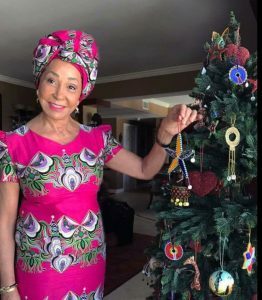 Because of her appreciation of Christmas ritual, Nhambu loves to celebrate Christmas and starts taking her decorations out of storage the day after Thanksgiving. Here are some of her thoughts about making Christmas memorable for the family. Relive your childhood Christmases with your children. Share and discuss with them the religious and spiritual first meaning of Christmas. Christmas has a collective and personal meaning. Take time each Christmas Season, before during and after, to talk about what personal expectations they have for the Season. Spiritual renewal? Gathering with family from near and far? The joy of giving and receiving presents? Christmas meals? Learn about Christmas traditions around the world, and how different religions and regions celebrate this time of the year. This is a way to early on teach your children to be open-minded and to respect all Christmas and Holiday traditions around the world. It takes time, effort and planning, but creating a festive atmosphere in the house by decorating is worth it. Christmas decorations take on their own traditions — where they go in the house, next to what. They almost have a life of their own and, over the years, they gather fond memories. 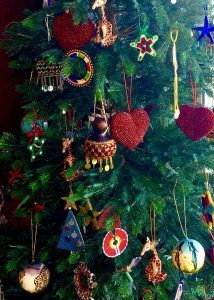 Trim the tree with the traditional ornaments, but add a few contemporary ones that will one day become heirlooms. Follow your heart in choosing and arranging decorations. They should be pleasing to you. Take time to look at all the work you’ve done through the eyes of a child who sees the ordinary room transformed into something magical and exciting. Never lose the ability to enjoy and wonder at Christmas. Love this story and all your memories, but it is still sad! Thank you for sharing your beautiful memories from the past and encouraging families to share their stories together. Have a Blessed Christmas.